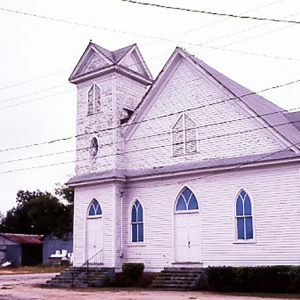 The congregation of Unity Baptist Church was organized in 1909 and originally met in the homes of members. Its congregation was an outgrowth of Kershaw’s First Baptist Church. Unity was the second separate African American church established in Kershaw in the early 20th century. The wood frame church was built by Deacon George L. Shropshire, a local contractor and carpenter. It is a particularly intact vernacular example of Gothic Revival church architecture. The parsonage adjacent to the church was built c. 1922 and is also listed on the National Register.